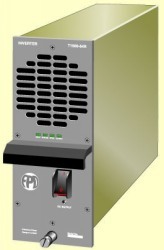 the T Series provides dependable, stable AC power in a wide range of applications including telecoms power systems, uninterruptible power supplies and renewable energy power systems. intelligent AC isolator for genuine n+1 parallel redundant operation. automatic paralleling simply connect outputs together. lightweight compact design 6kVA (4.5kVA n+1) can be configured in just 5Ux19". low psophometric input noise and inrush current to ETS 300 132-2.
integrated MCB option (54V only) for DC input isolation and downstream cable protection. 3kV RMS isolation to BS EN60950. optional metering via LCD display using an FPD Power Management Unit PMU200. simple interface to centralised monitoring system using volt-free contacts, serial link (via an FPD Power Management Unit PMU200) or open collector status signals. integrated CAN interface uses a two wire bus connection to carry all metering, control and status signals. programmable peak output at up to 240% of nominal. automated overload bypass switching for on-line UPS systems when used with an FPD Power Management Unit PMU200. high efficiency simplifies heat management. quick-connect cable version also available. (Q suffix). custom front panel servicefor OEM's. a host of advanced, innovative features make Sustain the first choice wherever a stable and reliable source of AC power is required.